We understand that some customers may implement SAP notes to use a solution because they cannot wait for upgrading to a new support package. The eDocument for Taiwan solution may be one of those cases. And during the implementation, you may have a lot of doubts on how to create an IMG structure and insert it to the upper structure. Let’s try this step by step. 2. Click the Create IMG Structure button . Enter ‘eDocument Taiwan’ in the Explanatory Text field. Assign the package GLO-EDO-TW and save it. 3. Click the Insert activity as subnode button . 4. Enter ‘EDOTWPROCSSDV’ in the ID field and press Enter. The information will be filled out automatically. Please do not change any data. Otherwise you will change the Customizing activity. This is especially important since the Customizing activity is already in your system after you implement the SAP notes. 5. Click Back and add other Customizing activities in the same steps above. 6. You can adjust the sequence of those Customizing activities by drag-and-drop. 1. Click the Insert structure nodes as subnodes button . 2. Enter ‘Business Add-Ins (BAdIs)’ as the Node Text, and click Continue. 3. Follow the steps mentioned above to add the BAdIs under the node ‘Business Add-Ins (BAdIs)’. 2. 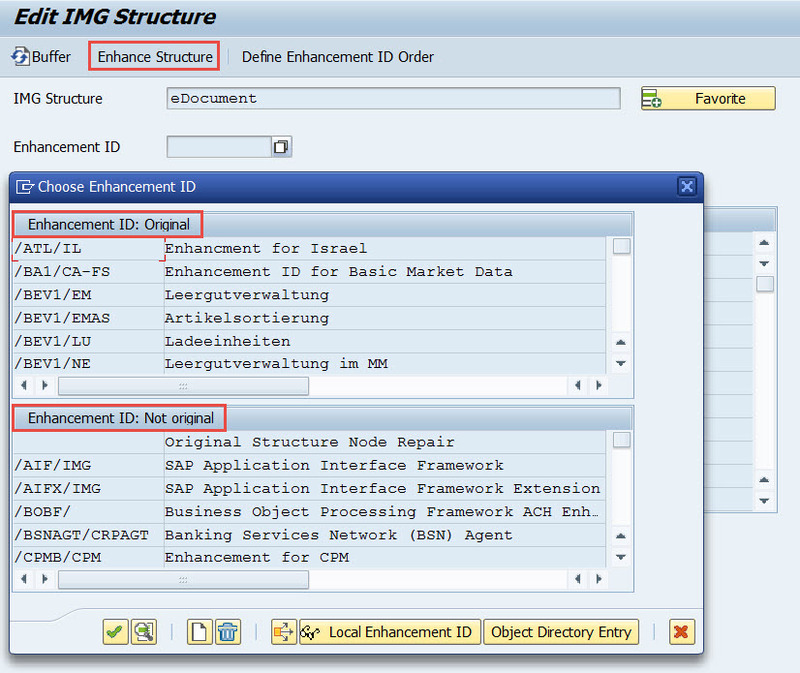 Enter ‘eDocument’ in the IMG Structure field using F4 help and select ID-SAP_APPL in the Enhancement ID Always remember to search in the Enhancement ID: Original tab first. If the enhancement ID is not there, try the Enhancement ID: Not original tab. 4. Expand the Country-Specific Settings node and click Spain. You put your Taiwan structure after Spain according to the alphabetical order. 5. Click Edit -> Nodes -> Insert IMG Structure -> On Same Level. 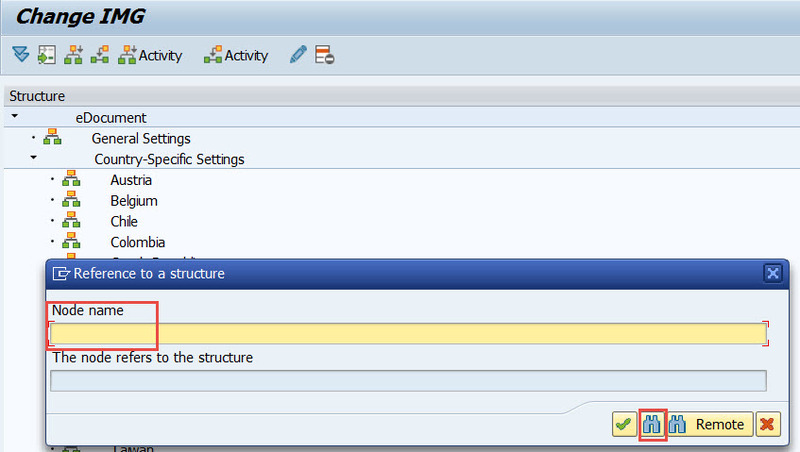 Enter ‘Taiwan’ in the Node name field and click the Find structure button. 6. Enter ‘eDocument Taiwan’ in the Title field and click Execute. Select the eDocument Taiwan structure and add it. Now your Taiwan structure is ready for use under the eDocument structure. This method of creating an IMG structure and inserting it to the upper structure can be applied to other IMG structures as well. Note that for those IMG structures that do not need enhancement IDs, you can just insert them using transaction SIMGH. Any doubts or suggestions, feel free to leave a comment below.